Many small businesses in San Juan, Puerto Rico, became unprofitable for months due to damages caused by Hurricane Maria and due to the subsequent decline in tourism. As a result, thousands of business owners left the island. Traveling with the Program for Narrative and Documentary Practice (PNDP), my goal was to understand the motivations of the owners who decided to stay. I thought this might be a way to frame the tragedy of the island’s collapsing infrastructure in a way that varied from past coverage. This was important to me because I wanted to invest this opportunity in sharing a different perspective and also because I wanted to tackle this issue with the resources that I had in hand. It was an opportunity to examine how community members took on community roles during and after the disaster and to show the subtler and more long-term financial and mental health effects of recovering from such a large set-back, even once the initial physical damage is no longer visible. I started by reaching out to a lot of small businesses over the phone. These conversations confirmed the challenges of keeping a business open after Maria, but I had a hard time finding people who were open to me filming them. That become much easier when I had the help of Paolla Vergas, a student from the University of Puerto Rico, who worked with me on the project. We went to businesses in person that she knew were interesting. 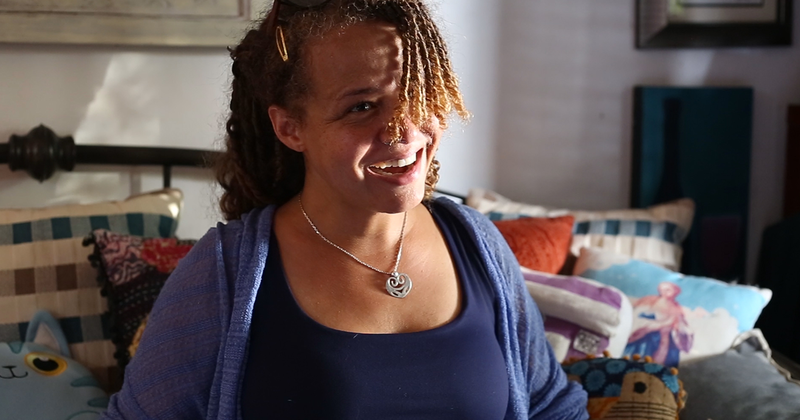 Paolla taught me about her home and she’s also passionate about video journalism. Her ability to factor both her insider knowledge of this place and an objective understanding of what’s practical when constructing a video story was essential in discussing potential directions for the project. This was also the first time I had a partner assisting me on a video, and I learned a lot from figuring out how to delegate parts of the project to her. Through Paolla, I met Lady Lee, the owner of The Poet’s Passage, which is a store front where paintings, poetry and other handmade crafts are on sale. The Poet’s Passage also functions as a community space where people come to socialize or seek advice from Lady, and there are poetry readings late into the night every Tuesday. Lady writes poetry while also running the business with her husband, Nico, who creates the paintings. After interviewing Lady and going to her house for dinner, Paolla and I decided to focus the project on Lady and her family. The hardest challenge while filming was balancing the development of trust and friendship with Lady, her husband and her daughter while constantly keeping the structure of the story in mind. During the editing process, it became even more apparent that we hadn’t completely succeeded in focusing the story. There are many angles that you could focus this story on; you could focus the story on the lifestyle of having your family intertwined with your business, the prominence of female leadership in San Juan, a single family who helped people around them physically while they themselves were struggling, the power and purpose of poetry or art in general, the injustice of minimal government aid after a disaster, the way that one family can help set a tone of generosity and the fluid use of money within a community, what people will do to preserve their home, or the way that community leaders are often overburdened by a constant demand for their emotional energy. I ended up reconciling all of this by thinking about how Lady’s commitment to poetry animates everything else she does. For her, living life in a poetic way means finding the right words in order to invest in people and prioritize relationships above anything else. This is an exhausting but powerful way of interacting with the world. Through this process, I learned a method of balancing forming relationships with being diligent about filming and conceptualizing a simpler story structure. I also had a hard time trying to let the quiet vulnerability of family moments play out while keeping the piece smooth and short. I think I never quite mastered this last goal, but this challenge is something I want to work on moving forward. Ultimately, I would like to return to Puerto Rico and do more journalism work. I really like working with people who truly want their voices to be amplified, and there’s so much more to learn about how this community in San Juan persists using a culture of informal leadership and generosity. lady lee from Hailey Gavin on Vimeo.